This newly luxurious Villa is located within the most prestigious Estate in Cabrera. The warm tropical sunlight kisses your face while a constant ocean breeze soothes your skin as you relax in peaceful serenity. 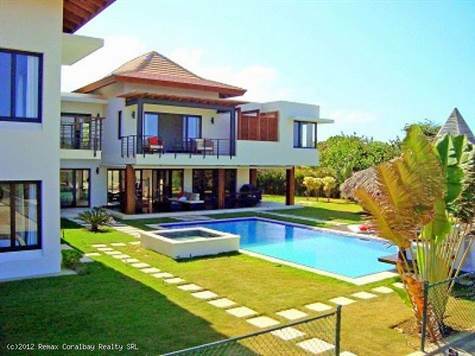 This dream Villa is a gorgeous 5 bedrooms / 5.5 bathrooms masterpiece covering 7200 square feet following a modern Bali design of simplicity combined with elegance and beauty. This dream Villa provides the perfect destination for your new home or vacation needs. Each bedroom in this villa has en suite bathroom and is fully air-conditioned with individual controls and offer patios/balconies overlooking the private pool and tennis court. The master bedroom has a romantic tub peeking out over the ocean view and also has a very nice outdoor shower and one indoors as well.... Excellent flow of short term rental income. Come and make this dream Villa your new destination !